I'm so excited to show you my most recent project. I just finished revamping the entry area right as you walk in the front door. Our entry area is d.a.r.k. because of the two story house design, the dark floors, and the lack of sidelights. other day is just around the corner to the left of this spot. It would be hard to make this area darker. Sheesh!! in the Ballard Designs catalog. mirrors would be helpful bouncing light. After placing the order I got scared! What if the quality wasn't good? What if the color was off? She's a soft white with a finish that doesn't look too brand new. The huge wall mirror is an Ikea find. You know large mirrors are super expensive. I'm looking forward to decorating this console for the seasons. What have you done lately in your entry? I love to look through the Ballard Catalogue and dream. 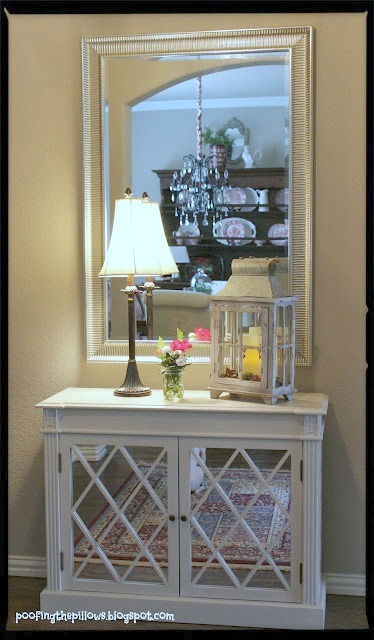 Your entry way piece is wonderful, the mirror is great above it - beauty and light. Stacey, your console is beautiful! I love the decor and furnishings from Ballard's. They just make you want everything! Great deal on the mirror, also! It's a beautiful piece of furniture! Everything goes together so well. I wish we had an Ikea in Tulsa or OKC. Beautiful pieces, they look great! So nice that the lighter colors as well as the mirror help to brighten up this area! The table looks just right in that spot (and who doesn't like a little reflection, too.) I also love Ikea mirrors. They are much better priced than other furniture stores. Your entry is very pretty! And you are so smart to go with the mirrors because it will help bounce around light. I love it! I like the way the chandy is reflected in the mirror and the pretty lantern looks great, too! I love this, Stacey, I'm sure the mirrors are a big help in bouncing the light around. I'm glad to hear the Ballard piece was good quality, I've never ordered furniture from them! Good for you!! I really love the console, Stacey. It looks perfect there and you were so smart to get a mirrored piece to bring a little light to the area. Ballard Designs never disappoints. It is all perfect. I love that cabinet from Ballards so pretty. I love that the light reflects off the mirrors too. Very pretty. 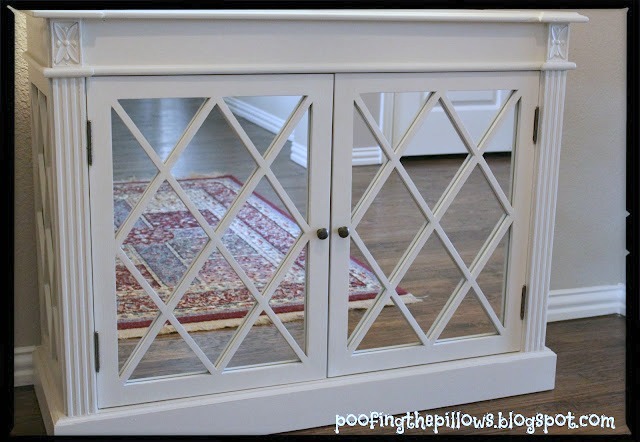 I have the same problem..dark entry, but you found the perfect mirrored console and mirror. It looks amazing. Have fun decorating it. That is a lovely piece! Love the mirrors on the doors! Stacey, I LOVE that mirrored console! It looks fabulous in your entry! I adore a big mirror too and yours looks great. Mirrors really do help to lighten up a space. Great choices! I love the mirrored furniture. It was a great choice for lightening things up! It looks great! Gorgeous! I actually love mirrored furniture and I've been looking for a mirrored nightstand since my bedroom is a little more on the blinging side. I think that console is a great choice and the mirrors will definitely bounce the light around. Love the reflection of your chandelier in the mirror! I love it Stacy! It looks perfect with that great mirror too! You found the perfect piece for your space. It is going to make everything lighter and brighter. Oh, I love it, great idea with the mirrors. My entryway is getting redone soon as the master bedroom is complete! I love mirrors ... great way to add light. Your table combination looks so fresh in there. I just love it all, Stacey! Your sense of style is impeccable! So pretty!! I love it. You have wonderful taste. Thank you for visiting my new kitchen. This is gorgeous, Stacy! I've never seen a little cabinet like this and I can see how much the light would bounce off it. Love your style! I agree with you that the color and look are perfect. Love how it reflects the light. I love your blog as it is often heart-warming and always inspiring. 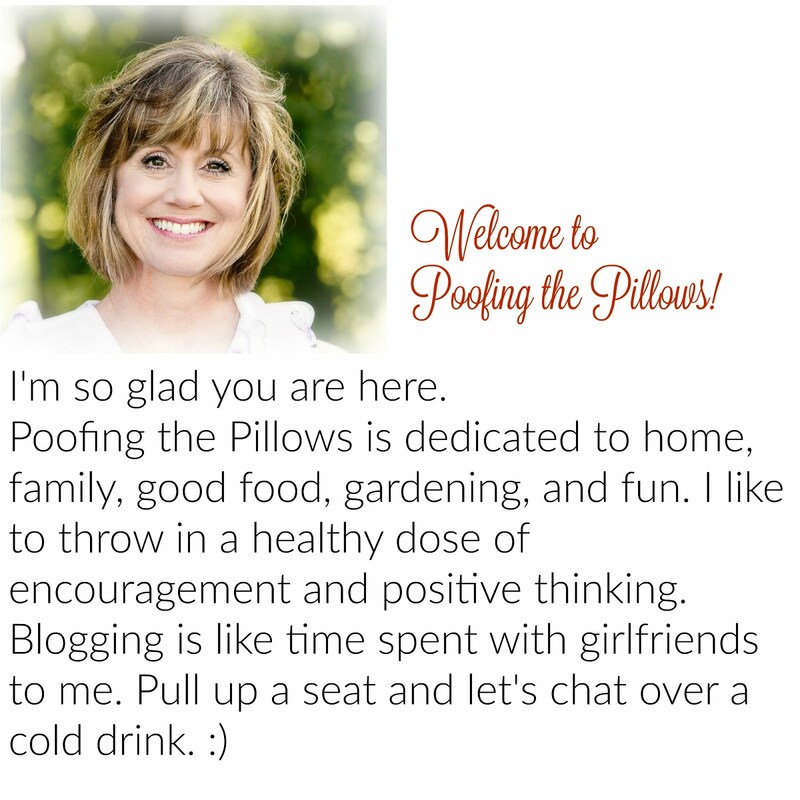 I put you on my blogroll so I won't ever miss your posts. I think piece is just perfect for that spot! I'm very pleased with my Ballards purchases so far. Good to know you had a great experience too! Wow! Together with the mirror you have created a spectacular entrance!! I love the mirrored doors. :) You rocked this one Stacey!! Your entry is beautiful...I'm loving the reflected reds!! My favorite color for a happy home! I love Ballards! I've seen other blogger's mention Ballard's and Restoration Hardware Outlets. I so wish we had one of those near us! (Did you hear we got a HomeGoods in Norman? YAY!) Your new cabinet is gorgeous, Stacey! Perfect for this space. Great choice in furniture, Stacey! Lovely design and colour! Enjoy it! Oh, she is a beauty! I love using mirrors in darker areas to brighten them up! What a beautiful piece of furniture! What a great idea to used a mirrored piece in your dark space -- looks great!